In Delaware, you do not need to water your lawn to keep it alive, even when we have a drought; UNLESS you have new seed or new sod. Then you must keep the soil moist until the seed or sod becomes well established. But, if we forget about new lawns for a moment, the only reason to water a lawn in our climate is to keep it green throughout the summer. That may be important if you are a golf course and make your money based on the playability of your course. But, if you have a regular home lawn, does it really make sense to spend one of our valuable resources, water, on keeping a lawn green all summer long? If you don’t water, your lawn will go dormant. The grass will turn brown, but as soon as normal rains return in the fall, the grass will green up again. If there are a few spots on your lawn that don’t green up, they are indicators of a more serious stress on the lawn that should be corrected, such as compaction, insect infestation or inappropriate high traffic use. Those spots should be fixed before the problem spreads to the rest of the lawn. If you are establishing a new lawn or renovating an existing lawn, it is critical to water your new seed or sod properly. Supply enough water at a slow enough rate to soak at least one inch of soil and ideally 3-4 inches. With new sod, you may need to water daily for the first week or so. Then as the sod starts to root into the soil, slow the watering to weekly. For newly planted seed, keep the soil moist. Since the soil is exposed or covered in straw mulch, it is easy to monitor soil moisture. For windy, sunny, open areas of lawn, that may require daily watering. When applying water to a newly seeded or sodded lawn, use a sprinkler or soaker hose and water in the morning so you don’t lose too much to evaporation. Avoid evening watering. If the grass stays moist all night, it is easier for fungal diseases to spread. Shrubs and trees, once established, rarely require watering, but there is a misconception about how long it takes for a plant to become established. We usually say it takes one year for every inch of caliper on a tree. Thus, a four-inch caliper tree, will take 4 years to become established. 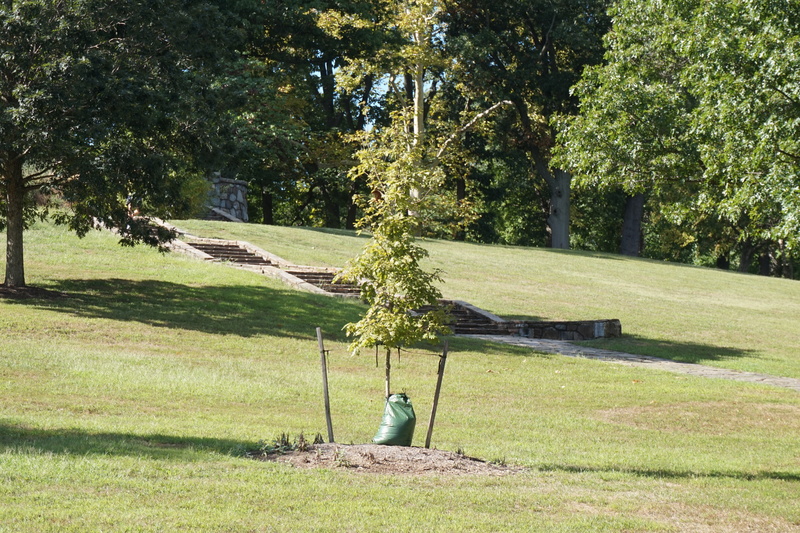 That means if we don’t get enough rainfall during the spring, summer or fall, the tree will require supplemental watering, for the next four years. If you planted a landscape in the early spring, most of the shrubs will be established by that summer, but you should still check soil moisture around those plants to make sure they are getting enough water. There are some trees that don’t tolerate drought well. Katsura (Cercidiphyllum japonicum) is one example; it will lose most of its leaves in August /September if we have a dry spell. It may be appropriate to provide some supplemental water during dry periods to specimen or special plants. When you water a landscape shrub or tree, apply the water slowly. Especially with heavy clay soils, water will start to run off after the first minute or so. Water is not getting to the roots, where it is needed, if it is running down the hill. Gator bags (those green plastic bags that zip up around the tree trunk) or simply a 5 gallon bucket with holes punched in the bottom, will allow you to fill the container all at one time and then the water can seep into the soil slowly. Container plants on your patio or deck require frequent watering. In most cases they are planted in a porous soilless container mix that is light but doesn’t hold much water. Also, as we near the end of the season, roots have started to fill those containers so there is even less soil volume available for absorbing water. In a hot, sunny location a container plant, especially a hanging basket, may need daily watering. But, it is always best to check moisture in the soil or container mix before adding water. In fact, overwatering can be as big a problem as under-watering. Surprisingly, the symptoms of too little and too much water are often the same. When a plant is under-watered, it doesn’t take up enough water through its roots so there is not enough water to be carried through the stems out to the leaves. Leaves start to brown on the edges, eventually turn crispy and finally die. When plants are overwatered, their roots can rot, which means they aren’t taking up water and the plant looks like it is suffering from drought. Well-meaning gardeners just water more, which makes the problem worse. Always check the soil to make sure it is no longer moist before you apply more water. Watering may seem like a mindless task but in fact the person in charge of watering is one of the most important people at a plant production nursery. He or she can make or break the success of a crop by the way it is watered. So, pay attention to how you water your plants at home. Let’s hope we get consistent fall rains, and nature can take over the task of watering. But, it is always a good idea to check for yourselves and make sure your container plants, newly planted shrubs and trees, new lawns and special specimen plants have the RIGHT amount of water. 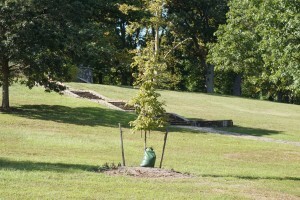 Gator bag used to slowly water this newly planted tree.